Videos often come accompanied by text files that contain the spoken words of a video combined with the corresponding playback times such that the texts can be displayed as subtitles to the video. Very often the SRT format is used for these text files, which can be generated for YouTube videos, for example, using various software tools. You can import these text files in SRT format into MAXQDA. Start the import as usual via Import > Documents. Then select an SRT file in the file dialog box. 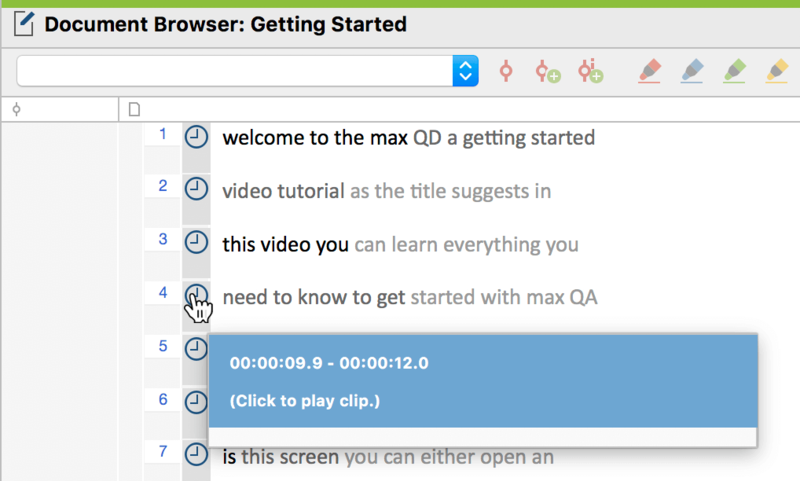 MAXQDA imports the file and asks you for the corresponding video file. The timestamps in the SRT file are converted into MAXQDA timestamps. Clicking on a timestamp plays the video file at the corresponding playback position. If you have downloaded an SRT file assigned to a YouTube video, this file may have been created automatically. YouTube identifies places in these files that were not easily recognized by the automatic system in a light gray and gray font. This color coding is adopted by MAXQDA during the import. Please note that such automatically generated transcripts have no punctuation either, that is, without commas, full stops, or other punctuation.